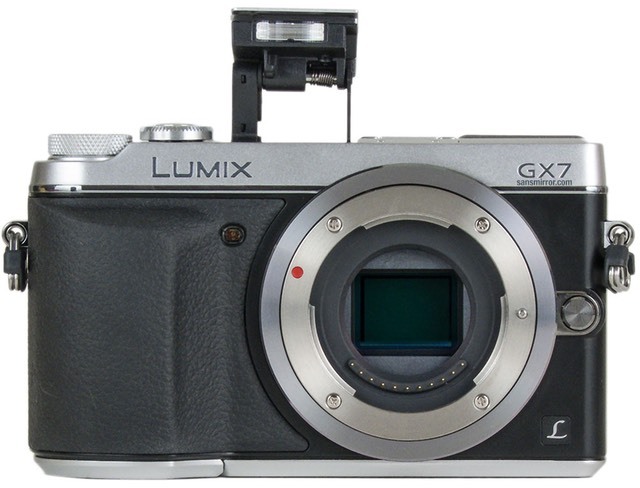 Most folk want to know about the displays first, so let's look at them: the interesting aspect of the GX7 is the tilting 2.764 dot EVF at the far left on the back of the camera. In its normal position, everything looks as you'd expect. However you can tilt the EVF up about 90�, so that you look down into it from the top of the camera. Those that do low-level or macro will love this aspect of the viewfinder, but I've found that it also allows me to shoot upside down a bit above me, too. The EVF itself has a fairly fast refresh with plenty of dots, though it also has a fair amount of contrast to it (looks a bit more like a small video monitor than some EVFs I've used). As with most EVFs these days, there is an eye-detect system to turn it on and off automatically (which can be overridden). 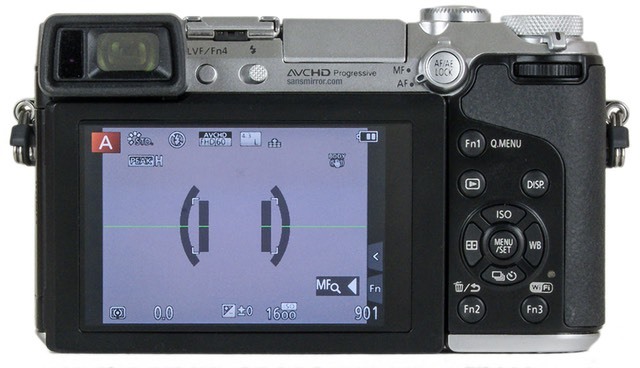 Panasonic claims the viewfinder covers the AdobeRGB color space, but I find that it's not color accurate. You also have a 3" tilting touchscreen LCD on the back of the camera. 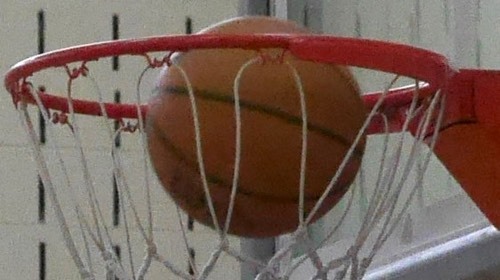 You can touch to focus, touch to shoot, and touch to reach certain settings. I'll have more to say on that in the handling section. The shutter supports 60 second to 1/8000 second exposures, though it also has a bulb limit of 2 minutes, which some might find restricting. Flash sync is 1/250 for external flash units, and 1/320 for the internal flash. It might surprise you to know that the GX7 has both a lens-centered hot shoe as well as a small pop-up flash. Generally the rangefinder-style cameras find that they have limited room up top of the camera, but Panasonic's moving and combining some of the controls gave them plenty of top plate space to put all three things side by side. The built-in flash isn't powerful (5m at ISO 100), but you can forceably move it to a tilt position with your finger. Focus is still only contrast-detect on the GX7, which is a bit behind what the other players are doing these days, but it's a fast contrast detect. For single shot use it should be fine. The tripod socket is centered with the lens. 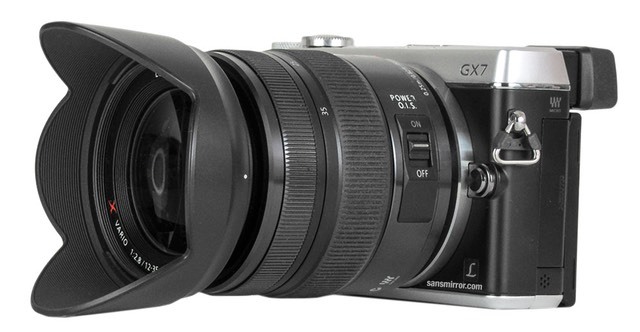 I suspect that the GX7 is one of those cameras that will get varied responses in terms of handling and ergonomics. Part of that is due to the way Panasonic crammed so much into such a small space, coupled with all the customization options. Let's start with some of the best aspects of the camera. For instance, that grip on the front? That positions my hand so that it blocks the AF Assist Lamp, a common problem on lots of cameras these days. I'm not a big fan of the AF Assist Lamps in the first place, but there are times when they're useful. But if to use them you have to change how you hold the camera, that's a bad choice. But then again, the bigger lenses all block the lamp, too (e.g. the Panasonic 12-35mm f/2.8, especially with the lens hood on). Features that are often compromised sometimes aren't worth having, in my view. 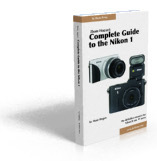 The FN1, FN2, and FN3 buttons are small black compact-camera style buttons arrayed around the Direction pad. They're tough to find by feel, which is a real shame, as having so many programmable buttons should be a benefit. In low light, the black buttons on black surface with thin lettering are tough to distinguish, too. The menu system has both pluses and minuses to it. In order to make the touchscreen work, options are displayed in relatively big type. Unfortunately, that means only five to a page, so the shooting menu becomes 7 pages deep, the video menu is 4, the custom settings 8, the setup menu 6, and even the playback menu is 4 pages long. Yep, that's 29 menu pages to wade through. Some of those are going to be used by less than .1% of the purchasers of the camera, methinks. How many of you have Vierra TVs that you want to direct link to? [Actually, the Vierra Link will work with any HDMI/CEC standard TV, but instead of saying that in the menus, we get a marketing message instead.] As with many camera makers, the menus aren't optimized very well, either. Clock Set is the number one option on the 6 pages of SETUP, but Format is the last option. Which do you use more? ;~) The good news is that menus remember where you left them, so since Format is the thing I most often use on that menu, that's where the menu takes me when I invoke it. Still, grouping options into likely use would be helpful. 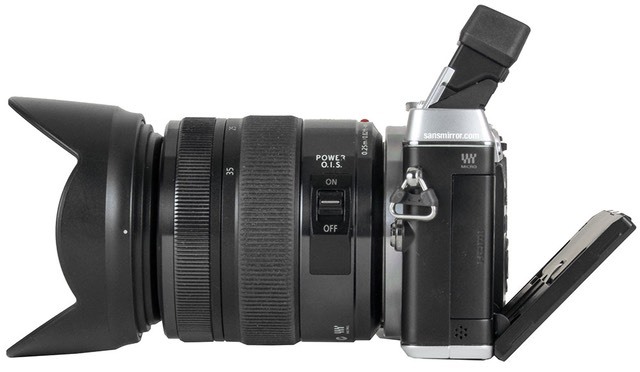 I can easily see the full EVF with glasses on, and folk with big noses will find the position of the EVF better than the standard centered DSLR viewfinder. I do find the EVF a little contrasty and a little grainy in very low light, but for most work it's fine and near state-of-the-art. Overall, for being a relatively small camera, the GX7 manages to handle pretty darned well for the serious photographer. There are some things you need to adopt to, and the programmable buttons are hard to find, but for most work I found it a comfortable camera to use. You'll want to pay a lot of attention to setting it up for your work, though. Like the Olympus m4/3 cameras, there are a lot of configurable options, almost to the point of overwhelming. It pays to spend the time to figure out how to optimize the GX7 the way it best works for you. This took me about a week to get to the point where I felt I had dialed in everything the way I wanted it. Still, there are two aspects to the Panasonic imaging ASIC's JPEG rendering that aren't quite up to the level of Olympus: detail rendering and noise handling. A lot of folk probably wouldn't notice the difference in either, but it certainly seems to be there for me I pixel peep: the Panasonic, even pushing the settings around to the best I can, seems to leave a very tiny bit of detail out that the Olympus doesn't. With raw files I'd say they're equal in capability, but not with JPEGs. Likewise, the noise reduction at high ISO values is doing more smudging of detail than Olympus cameras do in JPEGs, though it's a very well controlled smudging, without the blotchiness I've seem from some other rendering engines. Indeed, I'd even say the Olympus is "more blotchy" at very high ISO values, even though it retains a bit more detail and keeps color fidelity better. The JPEGs the GX7 produces are the best I've seen out of Panasonic, and frankly, I like the light touch they put on the data. If I had to complain about anything, there's just a touch too much yellow in most of the default color rendering. Funny thing is, I love the the GX7, but I'm not in love�with it. Oh dear, that old saw horse!